Singapore’s kampung days might be long gone, but there’s a hole in the wall establishment in heritage-rich East Coast that is hell bent on preserving our unique culture. Enter One Kind House, a modern, 60’s inspired kampung with an eclectic touch. They’re open for food and drinks from Tuesday to Sunday, 8am – 5pm – but One Kind House is more of a community than an eatery. The house is thoughtfully littered with art in the form of paintings on the walls, down to the bathroom sink. The art is by their family member, Ng Yak Whee, who is quite a famous Singapore painter. Plants line the entrance of the house and the dining area; and an urban farm fills the backyard. Of course, no hipster spot is complete without freshly brewed refreshments. 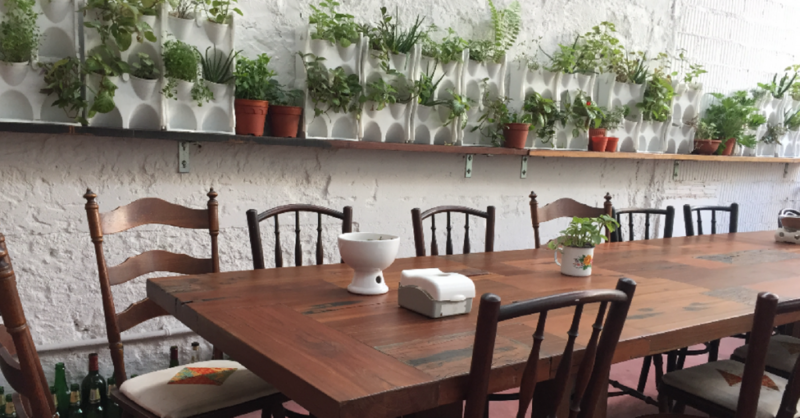 Blue Collar Collaborative has moved into One Kind House to serve up hot and cold brew coffee and tea – think cold blue pea flower tea with lemon grass. One Kind House was born out of nostalgia. The owner’s son, Calvin Soh, explained that during kampung days, families were able to reach out to their neighbours to borrow ingredients, or invite them over for food if they had overcooked. Kampung life was open and communal, unlike the closed-door mentality we have adopted today. Calvin and his family wanted to replicate just that. Mommy Soh is the head chef and owner of the house. Her plat du jour differs day by day, but one thing is consistent – she uses only the freshest, cleanest ingredients from her urban farm. Another constant on the menu: Mommy Soh’s signature duck egg kaya toast, mostly served during breakfast. Her other farm-to-table creations include fish laksa, mee siam with prawn sambal, ulam vermicelli – just to name a handful. She cooks some of these dishes over a traditional charcoal stove, so the flavours are top-notch! Because the idea of One Kind House is less of a business and more of a community, all of Mommy Soh’s creations are while stocks last (if the food runs out but you ask Mommy Soh nicely for more, she would whip up something nice for you). One Kind Family is a space for friendly neighbours and guests who are open to learning from both young and old. The Soh family, and of course, guests from all walks of life who pop by One Kind House for meals and refreshments, have a wealth of knowledge to share. So come for the kaya, and stay for the conversations. Also, read Lovers Of Old School Snacks, Here Are The Very Best Places For Your Nonya Kueh Fix!